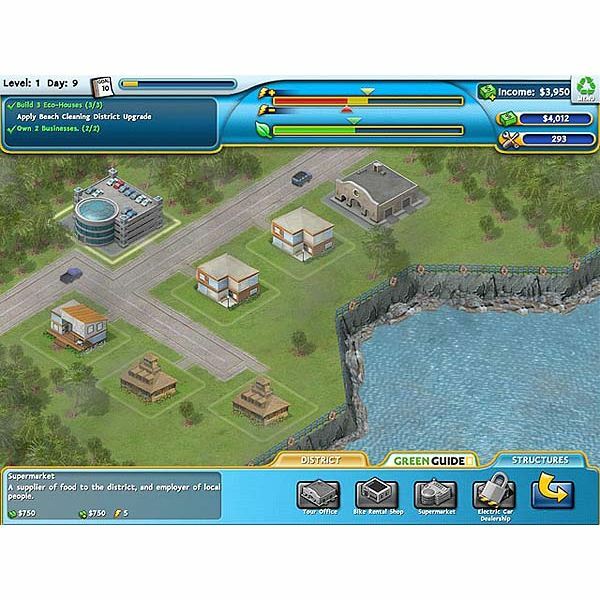 A tropical island is becoming polluted as a result of overusing energy resources and high volume of building. As a result, this paradise vacationing spot is losing its appeal to tourists and local residents. To save the island the mayor must decrease the pollution causing elements in the area and add or upgrade buildings and homes to green eco-friendly facilities. Build it Green: Back to the Beach can be played in a timed or relaxed mode. The island is broken up into twelve districts. You play the mayor who will need to make all of the decisions on improving each district. The levels in each district have specific goals. All will involve earning a specific amount of money, upgrading existing buildings or adding new ones to improve the area you are working on. To help you out, an advisor gives you some assistance to guide you where certain tasks need to be completed. At the top left side of the screen, you can see the amount of money you have available to spend. On the top right side, you can see what your total earning is per day. Every item you want to add to the districts has a cost and will require materials. Click on the “Structures” tab at the lower right side of the screen will give you options for purchasing different amounts of materials. You can find out any details about upgrades by highlighting their individual icons. If you don’t have enough money or materials for an upgrade, the icon will appeared grayed out. To upgrade an existing building, click on it. At the bottom right side of the screen, you can select available upgrades from the “Structures” tab section. Each non-green building will first need the “go green” upgrade. After this, other upgrades can be applied to the building as long as money and resources are available. For a new building, click on an available empty lot. The available building options will automatically appear at the bottom right side of the screen in the “Structures” menu. In many levels, you will need to keep an eye on the energy consumption in the district. This can be monitored at the top center of the screen. Current energy is monitored by the red bar. The yellow bar is the energy capacity. If the power goes out in the district, you will not earn any money. You may also need to make repairs on buildings as a result. Power plant options are available through the “District” tab. Select the “Upgrades” button to see what you have available. Energy can also be reduced by upgrading old buildings with the “go green” upgrade. Building industrial facilities like power plants and workshops near residential areas decreases the happiness of the people living there. However, if you place schools, grocery stores and bike shops nearby homes you will increase happiness. Existing buildings can be removed by demolishing them. Click on the appropriate location and then select the “District” tab to access the “Demolish” button. Afterwards, you will need to pay to have the rubbish removed from the area. Some of this rubbish is then recycled and applied to the amount of materials you have available. The “Green Guide” tab gives you information about all green buildings and structures. As each upgrade is applied to a building (old or new), other upgrades will become available. 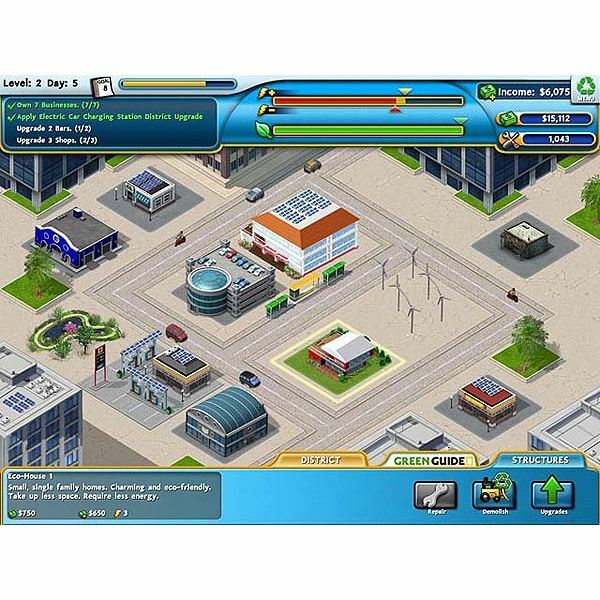 Screenshot images for the Build it Green – Back to the Beach game were created by Sheila Robinson.